Wow. Wow wow wow wow wow wow wow. 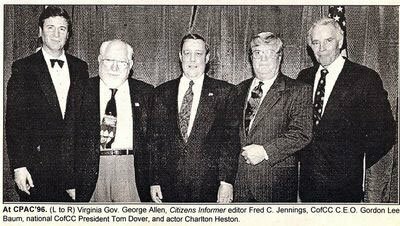 Lowell at Raising Kaine has a story about an article in The Nation which recounts George Allens connections to a white supremacist group. So, we should be in for quite the string of apologies and political acrobatics from the Allen Campaign. And, if the best they could come up with for the M-word was "mohawk" or "$#!#head", the excuses for this could make our heads explode. Comments on "Cameras are not George Allen's Friends"